Phil Brady in his DeBartolo Hall office. Phil Brady isn’t one of those poets who writes, gets published and then goes and hermits himself away somewhere to ponder life’s mysteries, only to resurface a few months later with another piece of prose. This Queens, N.Y., native, the son of Irish immigrants and a former basketball player, has spent a lifetime learning that it’s not just about the writing; it’s about the sharing. 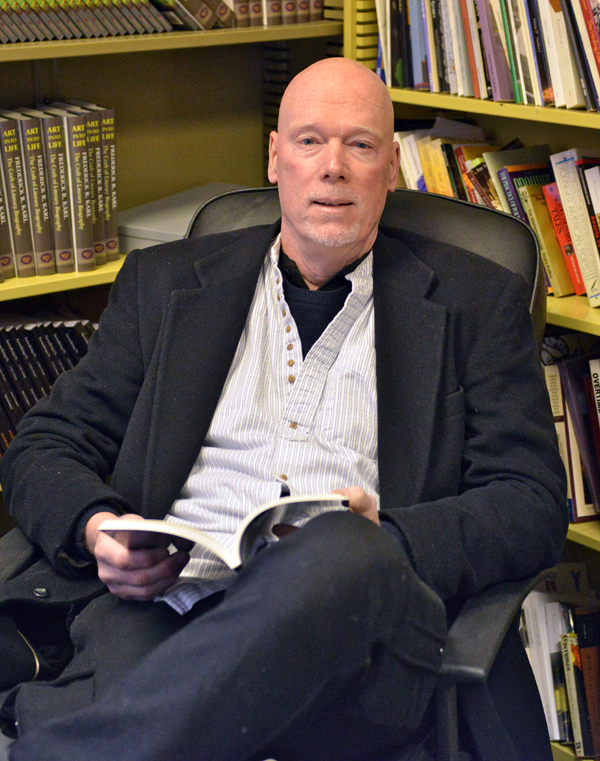 “My career has been more and more about spreading the word about literature, about taking the contemporary world of literature to places and to people who otherwise might not ever have the opportunity to experience it,” said Brady, YSU professor of English. For his efforts, Brady has been selected to receive the 2015 Governor’s Award for the Arts in Ohio. He will receive the honor for his work in Art Education. Over the past 45 years, only five other Youngstown area residents have received the award, all giants of the local art scene, including Joseph G. Butler III, John J. McDonough, Clyde Singer, John Weed Powers and Lou Zona. “It’s great company; it’s a wonderful thing,” Brady said. He traces his love for poetry to his childhood, where he fell in love with the sounds of Irish folk music at home and the Latin Mass while serving as an altar boy. “Poetry, to me, is a mystical language, built on sound and not on reading,” he said. He went to Bucknell University to play basketball, earning a bachelor’s degree in English, then master’s degrees at the University of Delaware and San Francisco State University and a PhD in English from Binghamton University. He joined the YSU English faculty 25 years ago. He wrote and taught, taught and wrote, publishing three books of poems, two critical books and a memoir, and teaching in places as far spread as Cork, Ireland, and, as a Peace Corps volunteer, in Lubumbashi, Zaire. He’s served international residencies in Scotland, Ireland, Spain, the Czech Republic and Nigeria, and received dozens of honors, including the Ohioana Poetry Award. In 2001, Brady founded Etruscan Press, a nonprofit literary publishing house that has been named this year by the Associated Writers Program one of the five top presses in the country. Etruscan was Brady’s chance to educate and share in ways he never had before. “To me, education is not a matter of what you understand, it’s a matter of being in a place where you are comfortable not understanding,” he said. That, Brady said, is where learning takes place. So he took his poetry, his Etruscan books and author friends, and introduced award-winning, international literature in places and to people who never knew such existed. They read poetry and handed out books for teen-agers in Youngstown inner-city schools and to octogenarians at Park Vista Retirement Village just north of the YSU campus. They made books available across the city via Little Free Library stations. And they even opened the world of literature to inmates in local prisons. “We’re trying to build a bridge and include these students and others in a vision that right now, for many of them, is beyond their horizons,” he said.